With a couple of days holiday to use up before the end of February, and not being too certain where to go, a friend suggested that Ghent was nice. I’d never been, and then I realised that if I did go, it’d be in time for the “Opening Weekend” of the Spring Classics – the one-day cycling races that fill the cycling calendar in this part of the world. 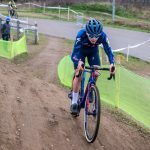 I’ve not been to one of these one-day races before, so I scoured the internet – without much luck – to look for suggested places to go and watch. I’d be staying in Ghent, and would only have public transport and my Brompton for company. In the event, for Omloop Het Nieuwsblad, I chose the Molenberg, the final cobbled climb of the race before the riders headed back into Ghent. In the morning I first headed into Sint-Pietersplain, the main square in Ghent, which had been transformed into a finishing straight and a coach park for the various teams. When I arrived, the team buses and cars were still arriving and being directed to parking spots. Omloop, as it perhaps sounds, means loop or circuit, so riders both start and finish in Ghent (at least they do these days). The atmosphere was friendly, with kids running around gathering autographs, teams riding to and from the presentation stage, and the newspaper Het Nieuwsblad, handing out free copies and souvenir cycling caps. There was little activity outside the Sky bus when I got there – the riders still inside. But of course in this part of the world, it was all about Etixx Quickstep and their superstar team – notably including Tom Boonen. Theirs was the last coach to arrive, and it felt like the crowd as one headed over towards it when it parked up. I didn’t even try to get close. Instead, train timetables being what they were, I couldn’t wait for the start and had to head off. I headed down the hill to the station, and bought a ticket to Munkzwalm. I’d identified this as station that would put me within fairly easy reach of the Molenberg. There was the small matter of the Belgian rail website actively suggesting I try to achieve a 3 minute change of trains, but it seems that the state rail mostly runs to time, and I didn’t even have to run between platforms. From Munkzwalm it was a 15 minute ride up a slight gradient to a small village where the route would loop through. As I rode, I had a pretty cold headwind to deal with, coming from the south, although the weather was otherwise pretty decent. I soon found the route and found myself chatting to a family who lived nearby. Before the men would arrive, the women’s race would come through and they were supporting Orica-AIS’s Emma Johansson. It seems that she stayed with the family locally quite a few times. 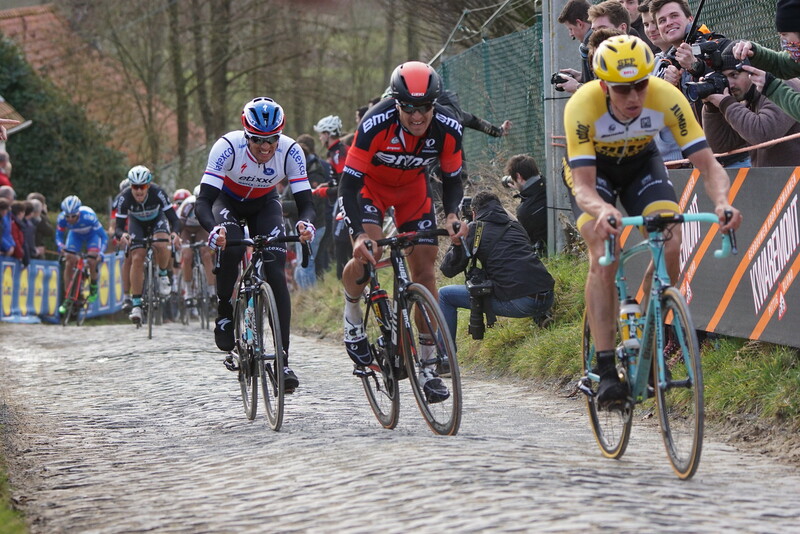 When I eventually found a decent spot near the top of the cobbled section of the Molenberg, I was just about the only person there, with the exception of another amateur photographer and a security volunteer. Someone had roped off the sides of the road to ensure fans stood back, but it then a question of finding somewhere with a good angle. The women’s race doesn’t get televised live, so there were no helicopters to announce its arrival – just a handful of cars. I press photographer managed to jump from his motorbike and position himself right in front of me, but I got plenty of shots away. Although the men’s and women’s races are run on the same day, the routes aren’t identical. That said, the Molenberg leads the way back. And the small group of riders who were fighting it out to the top of the hill where I was were essentially the same riders who’d fight it out for podium positions back in Ghent. Anna Van Der Breggen of Rabo Liv won, beating Eleonara Van Djik. Lizzie Armistead won the sprint for third. The women’s race was pretty spread out by this stage, and it must have taken a good twenty minutes for everyone to get through. Just when you thought the race had gone, another rider would come by. I felt enormously sorry for the final woman who was just about dying on what really shouldn’t have been a tough hill. 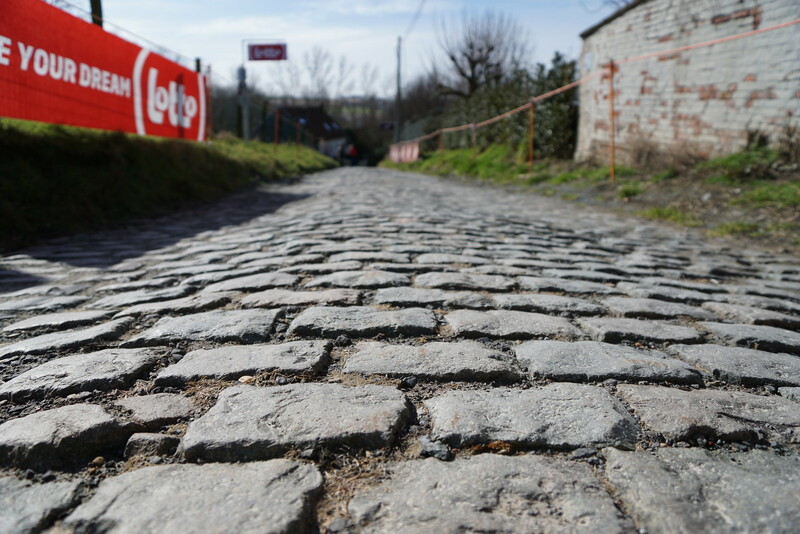 While cobbled, it’s smoother than, say, the cobbles of Paris-Roubaix. There aren’t the big gaps. A “broom wagon” minivan already had three or four riders within it. The official results list 64 abandons in total! Then the crowds basically vanished as there was a longish gap before the men would come through. I settled down for a homemade ham sandwich, and kept in touch with what was happening in the race via Twitter and occasionally the official Flanders’ Classics app. There’s no getting away that the crowds were bigger for the men. There were groups of cyclists in full lycra who arrived and cheered any amateurs climbing the hill; there were more press photographers stationed on the hill; and there were lots of people in motorcycle leathers who’d evidently been chasing the race around Flanders. The race lends itself to being followed like that, as long as you have transport that can get you around faster than the cyclists. The men came haring through – there was a break with three Etixx Quickstep riders, and a sole Sky rider in Ian Stannard. They’d already got a decent lead on the rest of the field, and the peleton came through a decent amount of time further back. A second part of the peleton was further still back – I think Bradley Wiggins was bringing up the rear here, having done a lot of work capturing an earlier break. And then the race was through, and the hillside quickly emptied. I had cameras to pack away and a bike to unfold. I was on my own! No rubbish. You wouldn’t have known anyone was there. It was downhill all the way to Munkzwalm. I got a friendly toot from my earlier family even though Johansson hadn’t repeated her win, and then it was back to the station. I could wait 8 minutes for a train or go to the nearby bar and watch the race’s conclusion. I made the right decision, bought myself a beer and settled in to see how the three Etixx Quickstep riders would finish off poor old Ian Stannard. There were 15km to go. 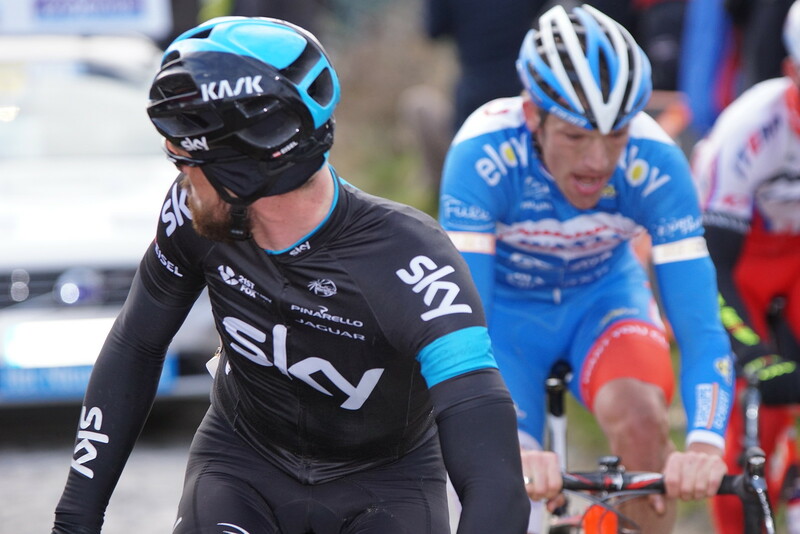 Tom Boonen made the first real effort, and Stannard didn’t immediately chase. In a 3 v 1 circumstance like this, he knew that he was seriously likely to be beaten. If the others played their cards properly, they could one-two him and exhaust him. But he’d been riding at the back of the group for many of those kilometres – as he was entitled. So he was perhaps a bit fresher. But weight of numbers should have outed. 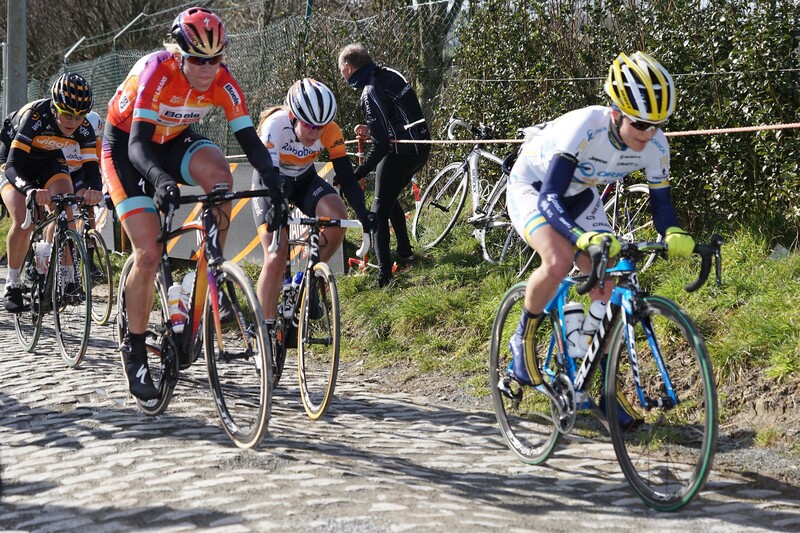 Having caught Boonen, Stannard attacked himself, and it was only Nikki Terpstra who was able to go with him. Boonen was always just too far away. Suddenly it was a two horse race. Stannard positioned himself well, and easily won the sprint. Remember – it is uphill at the end. A terrific ride. I was thrilled. A couple of other Brits in the bar slipped out. Everyone else in the bar, except me, was not happy. Boonen has won just about every one day classic. But not this. A couple more beers and I carried my Brompton out of the bar to the great amusement of a couple of elderly ladies who wondered if I was cycling all the way home now. A fun day out, and not at all muddy. I must come back here with a fullsize bike in tow. It’d be fun.